Mexican avocado and freshly squeezed lime as a base, the other 5 ingredients were all sourced nearby. Purple cabbage, carrots, spring onions, stored garlic or garlic scapes, cilantro. The cabbage was definitely my winning ingredient. By chopping it small, there was a great contrast of crunch and creaminess with the avocados. Spring, green onions and scallions were a perfect less pungent addition than the typical onion. Mix everything in a bowl, but add only two avocados at a time to ensure that they are not mixed too much. As my dad explains, the old Mexican traditions focus on having a somewhat chunky avocado, so you want to use each mix with the spoon carefully and purposefully so you don't end up with a paste. 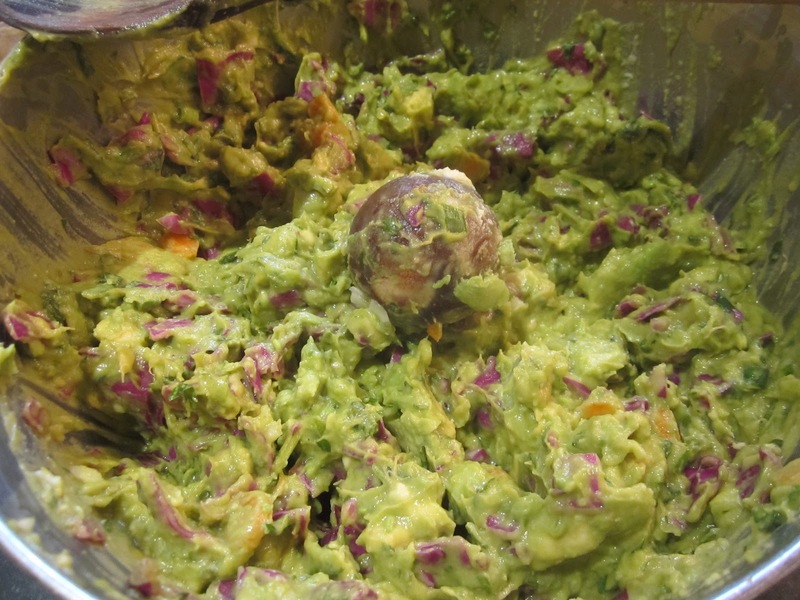 The spring and summer are always a time to celebrate, so while I end up eating wooden spoonfuls of this stuff right out of the bowl, presenting the guacamole mix onto a small sheet of seaweed has proved to be a huge hit for group gatherings. It's everything you love about sushi minus the fish. The seaweed is such a simple extra step, but it feels so good to take an idea and put it into action. Taking the presentation into consideration has really started to be an enjoyable part of the process for me. I think working around the kitchens and Blue Hill and being exposed to the artistic side of food, offers a whole other spectrum to the enjoyment of eating. There's the craft of producing the ingredients, but also of how to put them together and create the right combinations, an art-form worth a lifetime of exploration. Cilantro (or as we call it in Australia - coriander) is amazing stuff. It tastes great, but more than that coriander is great for reducing guilt. This has been lab tested with mice (somehow).